Pest Control & Exterminator Services with EnviroTech Exterminating, Inc. Serving Broken Arrow, Bixby, Jenks and the metro Tulsa area. Pest Control for Bed Bugs, Fleas, Spiders, Brown Recluse Spiders, Black Widow Spiders, Cockroaches, Termites, Ants, Carpenter Ants, Carpenter Bees, Wasp, Rodents, Mice, Rats, Raccoons, Squirrels, Opossum, Skunk, Pigeons, Bats and other Nuisance Animal Wildlife Removal. Visit our Pest Control website. Thanks for your comments. All Comments are reviewed to verify no profanity or unrelated spam is present. SEO Companies building links, contact EnviroTech Exterminating first for instructions and rules. Backlinks to sites or blogs with less than a page ranking of 1 will be deleted. 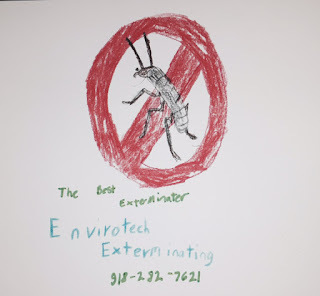 Thanks for visiting the EnviroTech Exterminating Pest Control blog page. It's our goal to fill this blog with information regarding our pest control services. This blog is a continuous work in progress and I hope you find it to be both educational and helpful. Any tips or idea's please feel free to contact me. If you find this page helpful please Google +1 the page so I can reach more people locally that may find these postings of interest.